There are some who simply work in the mechanical engineering field and others who do not just work in it, but have a passion for it. In the case of George Leone, whom many of you may remember as the Technician in charge of the Cal Poly Hangar Shop, its clear he has a passion for all things mechanical. Several of our previous stories have covered George and his involvement with Human Powered Vehicles, Supermileage cars and SAE race cars. 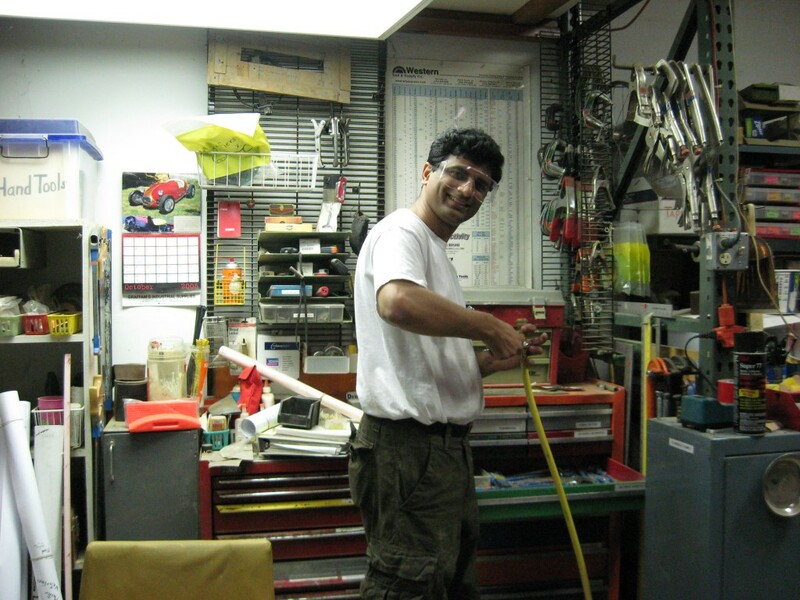 Well, George recently contacted us about a “side” project he completed and entered into the Boca Bearings 2012 Innovation Competition: A human powered vehicle known as Primal 2 that was built entirely at his house. Grand prize for the Boca Bearings 2012 Innovation Competition is $10,000. Check out this video about Primal 2, and be sure to vote for the best entry in the Boca Bearings contest as well! George says if they win the proceeds will be split evenly between Verant Chan, maker of this video to help further his filmmaking career, and the construction of Primal 3, which George hopes will be able to reach 85-90 mph! 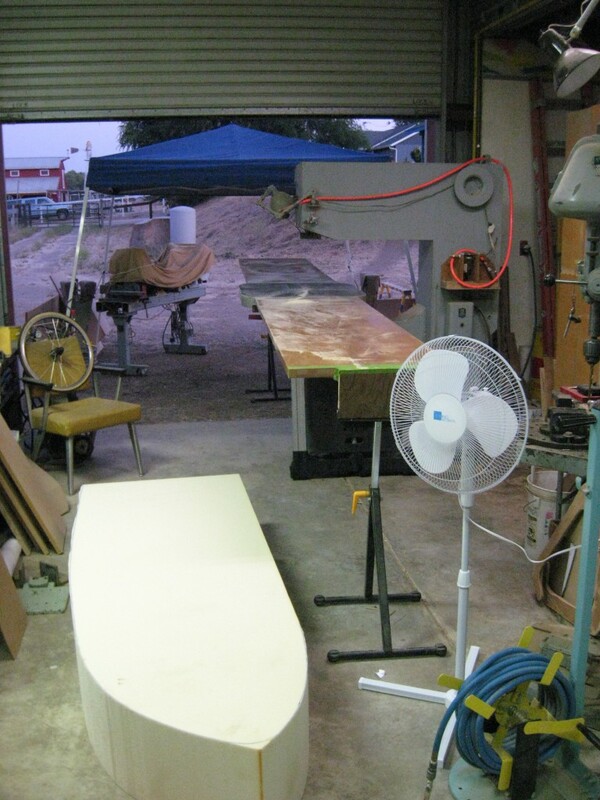 Primal 2 was built in the 30′ x 60′ barn George converted into a workshop next to his house. Alongside George, several current and past students, and professors from Cal Poly also helped build Primal 2. The ultimate goal was to achieve the highest miles per hour possible, which meant it needed to be as aerodynamic and efficient as possible while also maintaining a high level of safety. To make the aerodynamic body, George used Precision Board Plus PBLT-4 and hand shaped a plug for the car body. It was shaped on a custom made rotisserie fabricated from two Harbor Freight engine stands. 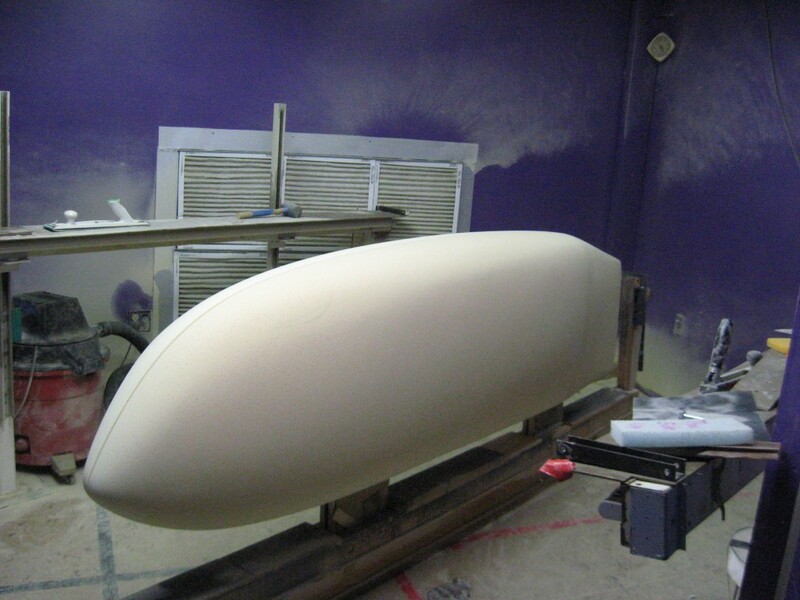 The plug was then sprayed with Duratec to make a mold for the car body. Finding that the initial body was not as aerodynamic as they liked, Duratec was sanded off of the existing plug and more PBLT-4 was added to alter the plug. The resulting changes in the body shape led to a 4 mph increase. Car body is fiberglass exterior, kevlar interior with 6k carbon bands for stiffening. 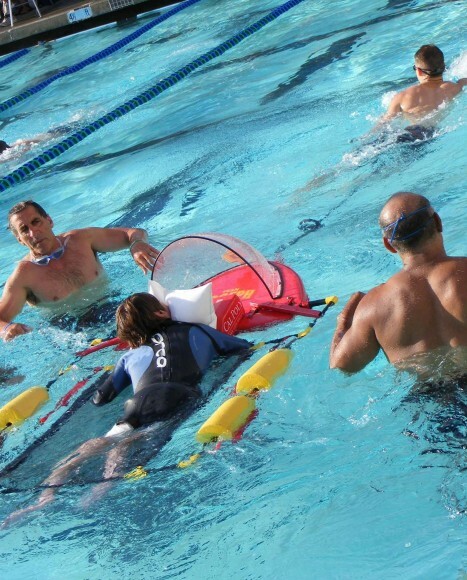 Divinicell ribs wrapped in carbon post-bonded and covered with kevlar provide extra strength. Chassis is chrome moly steel tubing built by Dan Baggs a local San Luis Obispo frame builder. Primal 2 also has a 5-point racing harness and a rollbar. Primal 2 was completed in a record 51 days. 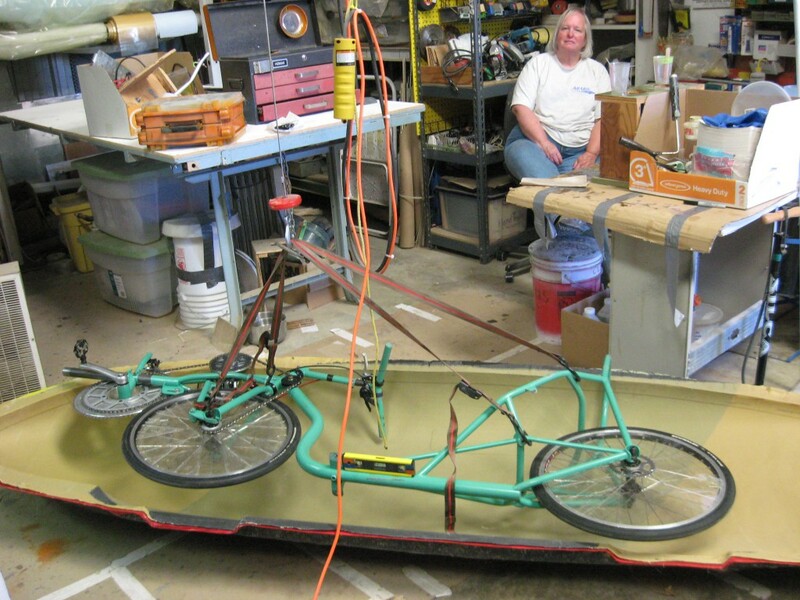 Most human powered vehicles take an average 2 years to complete! A lifelong surfer, George has lots of experience shaping surfboards which helped him develop the fiberglass skills he attributes to the quick finish of Primal 2. The highest speed it reached was 70.4 miles per hour, and it has crossed the 70 mph line on 3 separate occasions. 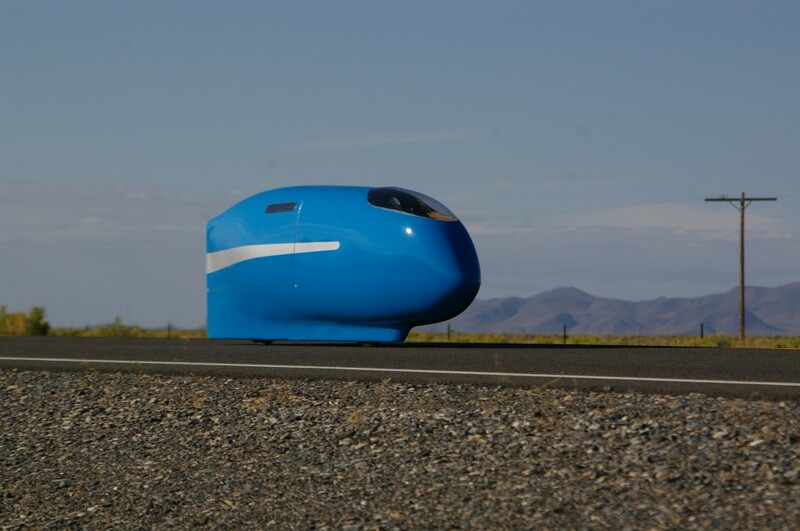 Pretty impressive for a vehicle powered entirely by the human body! 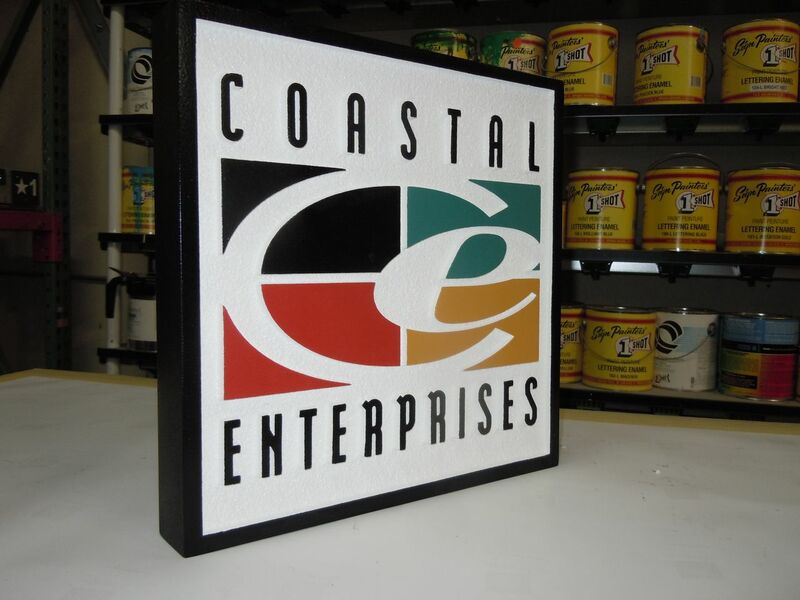 George Leone has been involved in all things mechanical since 1980, volunteering after attending a presentation where several students needed help building a fiberglass car body. Between 1984-1988 George and several other friends completed the worlds first all composite bike. 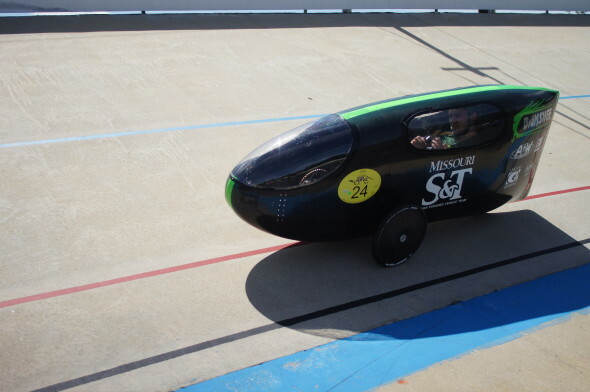 Since then he has grown quite fond of the Human Powered Vehicle concept and has been involved with many teams in years past. His wife, Carole Leone has even been President of the National and International Human Powered Vehicle associations. 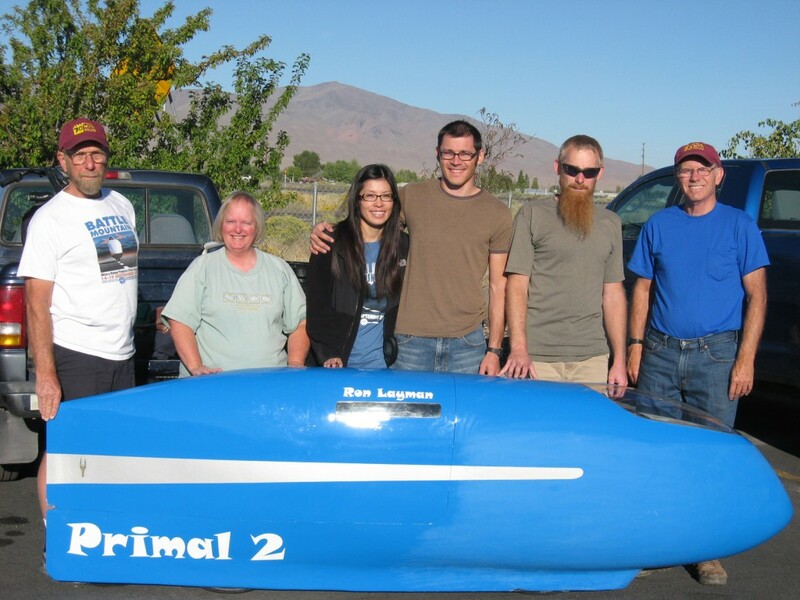 Part of the Primal 2 build team: (left to right) Dave Pocock, Carole Leone, Tamaki Layman, Ron Layman(driver), John Pocock (crew chief) and George Leone. Cal Poly Professor H.P. helping build Primal 2 in George’s shop.